the life of a wife: Are you an Introvert or an Extrovert? Are you an introvert or an extrovert? If you're not sure, Susan Cain in her book Quiet says that introverts "may have strong social skills and enjoy parties and business meetings, but after a while wish they were in home in their pajamas...prefer to devote their social energies to close friends, colleagues, and family...listen more than they talk, think before they speak, and often feel as if they express themselves better in writing...tend to dislike conflict...have a horror of small talk, but enjoy deep discussions." I've always believed that I was introverted but never liked that most people think of introverts as very shy people who don't talk very much. I would not consider myself shy and I certainly have a lot to say (poor Caleb), so when I saw this book I knew I wanted to read it right away. I really loved this book and found it fascinating. She describes so well the different characteristics of introversion and never describes it as inferior to extroversion. Several of my tendencies I realized are due to introversion, like how I have trouble projecting fake enthusiasm, why I let calls go through to voicemail most of the time, why I enjoy working alone better, and more. 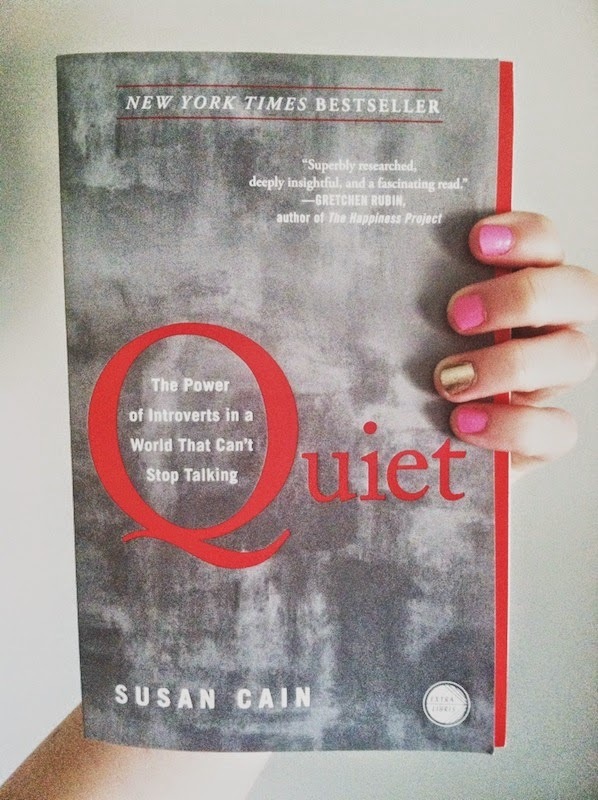 Cain also describes introversion in relation to nature vs. nurture, how far we can stretch our personalities to go beyond our "sweet spot", and the physiological side of introversion. One final thing I found interesting in the book was that introverts are more likely to share intimate things about themselves online. That's certainly true for me, so I'm curious: how many of you bloggers are introverts? Definitely introverted! This book sounds really interesting, I'll have to read it!